HTML5/CSS3 Photo Gallery is a plug-ins for Adobe Lightroom which allow making instant gallery which cand view on modern desktop and mobile browser. No plugins is needed. 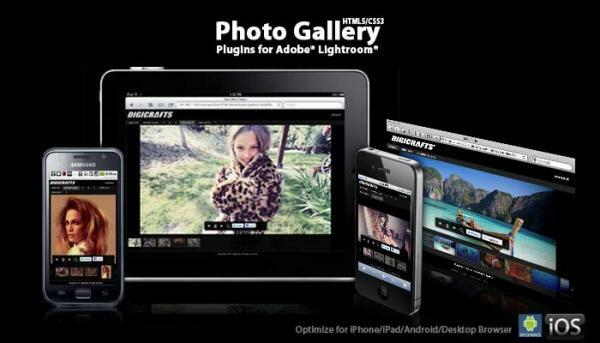 Now photographers can make photo gallery which can view on billion of mobile device. 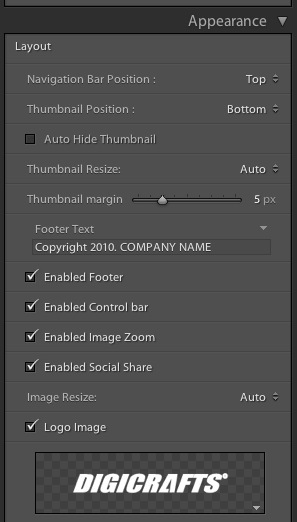 With extremely "easy-to-use" interface, just a few click from the interface to create the portfolio instantly. Photo Gallery is optimize to work with mobile browser in iOS device such as iPhone and iPad and Android devices. Also work will modern desktop browser such as Firefox, Chrome, IE8. No plugins needed. Photo Gallery support auto layout for iOS and Android device. The layout wil adjust when device orientation changed. The layout is optimzied for mobile screen resolution and touch control. Photo Gallery build in feature to enlarge your image. Support muti-touch gesture zoom in IOS devices. Build in deep link feature allows direct url to each photo. Increase user experience. And easy for distribution. Photo Gallery build in support social feature. You can share your photo gallery in Facebook and Twitter. This Photo Gallery is build with modern HTML technology in most modern browser. No Flash plugin is needed for view.